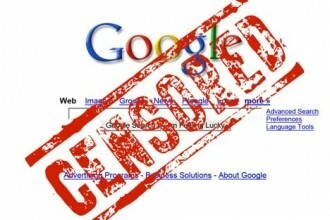 Earlier this year, Google quietly began blocking filesharing-related search terms from certain features. Queries such as "BitTorrent," "RapidShare," and "Megaupload" still produced valid results if you completed a full search, but disappeared from the company's Autocomplete and Instant search services. The former provides you search recommendations below the text box when you type, while the latter displays results as you enter your query. Google has since expanded its censorship program to include many other popular filesharing sites, according to TorrentFreak. Searches including "thepiratebay," "the pirate bay," "isohunt," "torrentreactor," "btjunkie," "kickasstorrents," "sumotorrent," "btmon," "extratorrent" and more are now being blocked in Autocomplete. Interestingly, "thepiratebay.org" and "pirate bay" are still visible, so it seems the filter isn't all-encompassing -- yet, anyway. Again, to be clear, results for those terms aren't blocked on full searches, just Autocomplete and in some cases, Instant searches. This won't affect most users who already know where they're going, but it can dent overall traffic levels. TorrentFreak draws attention to a graph that shows a rapid decline in Hotfile searches after it was censored in January. There is an understandable push to reduce Web piracy, but Google's actions affect real businesses. Companies BitTorrent and RapidShare are completely legitimate operations. RapidShare decried Google's decision earlier this year, saying the company had "obviously gone too far." A similar message is being echoed by sites affected this time around. "It's a lot more subtle than the censorship attempts made possible by the pending PROTECT IP and SOPA bills, but it's still censorship and it starts small. Google is increasingly becoming a self-righteous Big Brother of the Web. So much for 'Do no evil'," IsoHunt founder Gary Fung told TorrentFreak. The ever-vocal folks behind The Pirate Bay have also chimed in, saying this is "just another step towards censoring their search engine altogether -- without a legal basis. We're also wondering why this happens at almost the same time as they've released Google Music -- a service where they sell music which in some cases might be found on The Pirate Bay." Is Google just doing the entertainment industry's dirty work, or is this a valiant effort to combat piracy?